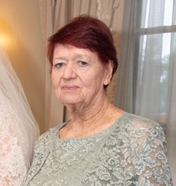 Obituary for Anne (Harrington) Light | Thompson Funeral Home, Inc.
Anne Light, 81, of Orangeburg passed away on Saturday, January 12, 2019. Funeral services will be held at 1:00 P.M. on Sunday, January 20, 2019 at Jericho United Methodist Church in Cameron. Burial will follow at Jericho United Methodist Church Cemetery. Rev. Jack Gibson and Rev. Roger Goupil will be officiating. The family will receive friends from 12:30-1:00 P.M. on Sunday, January 20, 2019 at Jericho United Methodist Church prior to the funeral service. Mrs. Light was born on January 20, 1937 in Alexander, N.C. She was the daughter of the late Joseph Earl Harrington and the late Clara Ethel Jarvis Harrington. She was a member of Jericho United Methodist Church in Cameron. Mrs. Anne was predeceased by her husband of 60- years, Walter Alan Light; a grandson, Benjamin Michael Albro and a brother, Richard Harrington. Survivors include her daughter, Sherri and Robert Albro of Zionsville, PA; a son, David and Tyndall Light of San Angelo, TX; five grandchildren, Clara Jean Light, Walter David Light, Brandon Scott Albro (Danielle), Joseph Aaron Albro, Hannah Elizabeth Albro; sister, Faye Burgess of Morganton, N.C.; brother, Joseph and Susanne Harrington of Morganton, N.C.; sister-in-law, Sandra Myers of Lexington, N.C. and a number of nieces and nephews. Memorials may be made to Jericho United Methodist Church Cemetery Fund; C/O Linda Hightower at 11 Houck Gin Road Elloree, S.C. 29047.